The Christ in Prophecy Journal: Christian Doctrine: Pastors Scared to Teach? Why are pastors scared to teach doctrine? Nathan Jones: To go along with our initial question, Eric, how could teaching doctrine actually hurt pastors? Would it be hurting their numbers? Do they feel like the topics are going to be too exclusive which would restrict them in going out into the world? Just what is stopping them from teaching doctrine? Nathan Jones: I can imagine. For example, the study of hamartiology or sin should certainly make people uncomfortable, and hopefully repentant. Eric Barger: When you start talking about sin, you next have to start talking about repentance, and then you have to start talking about the judgments of God. This is tough, tough material that just goes counter to everything the modern church growth movements have to say. They're teaching, "Here, follow our plan and you will fill your church and so then you will have a successful church and you'll be living happy ever after." That is not what the Scripture says. Nathan Jones: So, churches then have moved from the teaching of sound doctrine and growing Christians as most important to just getting numbers and filling the pews as what's more important? Eric Barger: Yes, exactly. Churches today have placed numbers over doctrine itself and what it stands for. Nathan Jones: Most people don't even know what the word "doctrine" means when you say it. I can say, "Let's get back to teaching doctrine," but will mostly get back blank stares. Eric Barger: Crazy, isn't it? I believe we can find the idea of doctrine or at least the phrase that deals with doctrine about 50 times in the Scriptures, so it's pretty important. Dr. Reagan: Doctrine can have a tremendous impact upon one's faith and how we live. For example, I grew up in a church that said we were saved by baptism. Now, that is a doctrine, but everytime somebody sinned what did they do? They went and got baptized again, and again, and again, trying to work their way to Heaven instead of relying upon the grace of God. They didn't know anything about grace. At that time I thought grace was a blue-eyed blond! Eric Barger: We can't add to or subtract from our salvation. We either are or we aren't saved. I will never forget hearing Dr. Walter Martin who was a mentor to me make this statement, "That you are either saved or you are not saved is like being pregnant. There's no such thing as being a little bit pregnant." He made a great point and that's oh-so true. Once we get the doctrinal foundations of the Bible to our people and in such a way that they can understand it, then they can go on and do what God has called them to do. They will walk their Christian life out in faith. It's such a shame that we so often see people who are confused about needing works for salvation, thinking if only they were just good enough. Dr. Reagan: Another doctrinal error that comes to mind is people's concept of God. Is God a stern task master? Is He a slave master? Is He the one that is looking for an opportunity to zap you? Or, is He the cosmic teddy bear who just winks at sin and says, "Oh well, you know, it's not all that important." Our view of God has a tremendous impact upon our faith and the way we live. Eric Barger: It sure can. Along with His justice, we also need to see God as a loving Father who says He wants to give us good things. The Scripture teaches clearly in Jeremiah and so many other places that He wants to. But, He is also a God who is going to judge sin. He is going to judge sin, but He gives us a way out — Jesus. When Jesus came and died on the cross, He gave us the way out of judgment and punishment. Dr. Reagan: That's right! Again, I grew up in a church that taught me that there wasn't one verse in the Bible that even implies that Jesus will ever put His feet on this earth again. We were told we shouldn't think about it, that we shouldn't worry about it because it's all in God's hands, and not to be the least bit concerned about it. It's amazing I ended up as a Bible prophecy teacher! But, my whole life was transformed when I suddenly realized that Jesus is coming back. He is coming back to this earth and He can come back at any moment. If you could ever convince a Christian that number one that Jesus is coming back and number two it can occur at any moment, it will have a purifying effect upon their lives and also motivate them to evangelism. Nathan Jones: The big push right now especially with the Post-Modern churches is the idea that the church has been too exclusive in the past and so now needs to get out of the building and into the world. A lot of churches rightfully so want their churches to be out there in the communities doing missions and sharing Christ and meeting people's needs. Eric, what can we say to churches to assure them that it's okay to teach doctrine and that it won't hurt their efforts towards outreach and missions? Eric Barger: I think that the most important thing they can do is to reexamine what their churches are based on. They need to go back and look at who we are as Christians from the Bible. Once they realize that God wants them to be both out in the world as well as sticking to His teachings even if they can be divisive at times, they'll move forward on both fronts more securely. Churches that begin to teach the things of the Bible rather than all this pop human psychology that's called Christian these days flourish spiritually. 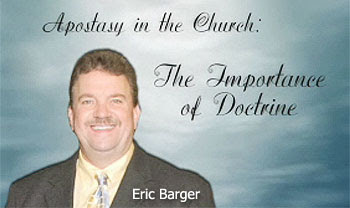 Eric Barger: Those churches which do not teach the Bible shrivel up and start absorbing all sorts of non-Christian teachings. Here are a couple statistics that really illustrate this, because I think most folks today are saying, "Oh, it can't be really that bad." I'll read them from my seminar outline put to DVD called "Discernment or Deception, Which Will you Choose?" I quote a Pew Forum poll from December of 2009. They're a very widely known polling source. The Pew Forum concluded that many Americans mix multiple phase Eastern and New Age beliefs. Are we immune to this? We are not immune to it. Just listen to this, according to the Pew survey 65% of US adults mix contradictory beliefs such as blending Christianity with beliefs in reincarnation, astrology, and the presence of spiritual energy in physical objects. They also say that 28% of people who attend church weekly attend services other than Christian services. Now listen to this, 24% of Americans profess belief in a variety of Eastern and New Age beliefs, 22% of Christians say they believe in reincarnation, 25% of Americans profess belief in astrology, and 23% of Christians say that astrology is okay. Concerning yoga, can you believe that 23% of Americans believe in yoga as a spiritual practice, and 21% of Christians believe yoga is a spiritual practice? We all ought to believe it is a spiritual practice, but not believe in it, that is the difference. The poll goes on to conclude that 39% of professing liberals (whatever that might have been to this poll) believe that yoga is a spiritual practice, and 15% of those who are conservative say they do. Concerning the occult, 29% of Americans say they have communicated with the dead, and that is necromancy which is forbidden in Deuteronomy 18. A reported 29% of Christians say they've done it, and 20% are evangelicals who say that it's okay. While 18% of Americans believe in the presence of ghosts, 17% of Christians say that they do. And, 15% of Americans say they have consulted a psychic which is shockingly nearly the same as 14% of those claiming to be Christians say they have done the same. Concerning the pagan earth religions, 26% of Americans believe in spiritual energy in trees. This is the source of the environmental movement. Sadly, 23% of Christians say they too believe in spiritual energy in trees." If you don't think we need doctrine taught in our churches, this illustrates how desperately we need it. In the next part of this series on the importance of Christian doctrine, we'll ask Eric for some historical examples of doctrinal drift. Excellent article and so true. I grew up Methodist and never heard Grace or Revelation taught. It taught the Trinity but we recited something that said we believed in the Holy Catholic church along with it. I definitely thought other religions might have the answer but by the grace of God, as I prayed for truth He led me to bible scriptures that always answered my needs at the time. At seventeen Revelation started to interest me, my dad always dismissed it and he taught sunday school. But being drawn by the Holy Spirit, which I also didn't understand until forty years later, I have come to understand and embrace so much that was a mystery. God is so amazing and will answer the questions we have about His word. But forty years later I'm still asking and look forward to eternity where my teacher,Jesus Christ,can explain the wonders of his Kingdom. God Bless! Having an impact on the dehydrated is enormously encouraging. All The Holy Spirit requires is a tiny crack in the armour of ‘soppitude’ and He can pour in a deluge to break up the hardest of ground. Bless you dear Nathan for your kindness toward this old boiler; I truly appreciate your loving concern. Please don’t sanitize or censor the blog on my account. I have removed many a barb from fingers and heads – it’s interesting what can be caught in tepid waters; so I promise I am not at all fazed by the ‘slings and arrows’. I much prefer an open assault to under-cover pestering. As long as I have The Lords approval and blessing, it’s great with me. It is no doubt one of those WOLVES on the lookout for an easily digested meal. P.S. Just note that at present, I am not on-line from Friday a.m. until Monday p.m. at least. So if Gobsmacked and pack wish to notify me of any more forthcoming attractions to the ‘love boat’; I am more likely to see it during the week. Thank you. 1) Go to now, ye rich men, weep and howl for your miseries that shall come upon you. 2) Your riches are corrupted, and your garments are motheaten. 3) Your gold and silver is cankered; and the rust of them shall be a witness against you, and shall eat your flesh as it were fire. Ye have heaped treasure together for the last days. 4) Behold, the hire of the labourers who have reaped down your fields, which is of you kept back by fraud, crieth: and the cries of them which have reaped are entered into the ears of the Lord of sabaoth. 5) Ye have lived in pleasure on the earth, and been wanton; ye have nourished your hearts, as in a day of slaughter. 6) Ye have condemned and killed the just; and he doth not resist you. 7) Be patient therefore, brethren, unto the coming of the Lord. Behold, the husbandman waiteth for the precious fruit of the earth, and hath long patience for it, until he receive the early and latter rain-James 5:1-7. With our wages declining while inflation rises, even the basic neccessities come out of reach for many families. Corporate and Banking executive bonuses continue while the average working class American is denied just wages. This however is not limited to the U.S., it is a global problem, even the citizens of Israel are marching to condemn this. What we perceive as an economic crisis is actually the justice of a righteous God in action, for the Lord has heard the cries of the oppressed and the wealth that has been accumulated at the expense of those whose wages are held back by fraud will come to nothing. Praised be the Lord God! Hope you are safe over there with all that insanity going on! Bless you for your concern. I was wakened by the police helicopter early this morn'; it was very busy. Found out there were some incidents about two miles from us. As we are seen as a 'rat run' the police tend to check us whenever there are problems. With our large plot with many trees, we are seen as a hiding place; so we are used to it. One summer, I was on the front lawn when the 'copter hovered directly above me and spoke to me through the loudhailer. I couldn't understand, so I spread my arms and did a big shrug. So he repeated very slowly if I would search our out-buildings and bushes for a missing toddler. So I did, and as I looked hither, thither and yon the 'copter stayed right above me - in case someone pounced perhaps, or if I found the little one I suppose. All was well in the end; the child was found safe and well not long afterward. We aren't scared, but we are prepared for the real possibility of trouble spilling into our 'rat run'. It wouldn't be the first time. May I ask if you saw my message to you on the other thread? I don't need a reply, I would just like to know if you saw it. Sorry I can't do a DrNofog blue 'here'; can't fathom it out at all. Hey Ho! That's life, no worries! Praise The Lord lots. I have been wondering! Because of your interest in UK comedy; I wondered if you have been puzzled by the very BRITISH idiom ‘gobsmacked’. Do you know it? Hyacinth Bucket wouldn’t dream of using it, but Onslow, her brother-in-law would. Sue said "May I ask if you saw my message to you on the other thread?" No, I didn't. Which article was it under? I have to admit sometimes when I'm reading your posts it's like trying to listen to someone through a helicopter "loudhailer". Thanks for the Britspeak comment - love it! Friday 29th July. According to Oprah: Reality. "There's no better test as to whether a man is really preaching the New Testament gospel of salvation than this: That some people might misunderstand it and misinterpret it to mean that it really amounts to this, that because you are saved by grace alone, it doesn't matter at all what you do. You can go on sinning as much as you like because it will redound all the more to the glory of grace. If my preaching and presentation of the gospel of salvation does not expose itself to that misunderstanding, then it is not the gospel. . . . There is this kind of dangerous element about the true presentation of the doctrine of salvation." antinomianism that the Early Church Fathers even had to deal with seem to be alive and well today and need to heed Romans 6 and Ephesians 2:10.